Hide-a-Lite 4 LED tape lighting is state-of-the-art technology for the 21st century. Begin the creation of your customized installation with this transformer which can provide power for up to 33 feet of Progress Lighting LED tape. Includes integrated short circuit and overload protection with auto shutdown/reset. Dimmable with many incandescent and most ELV controls. The Hampton Bay 50-Watt Transformer with Light-Sensor and Digital timer allow you to control your landscape lighting system automatically. 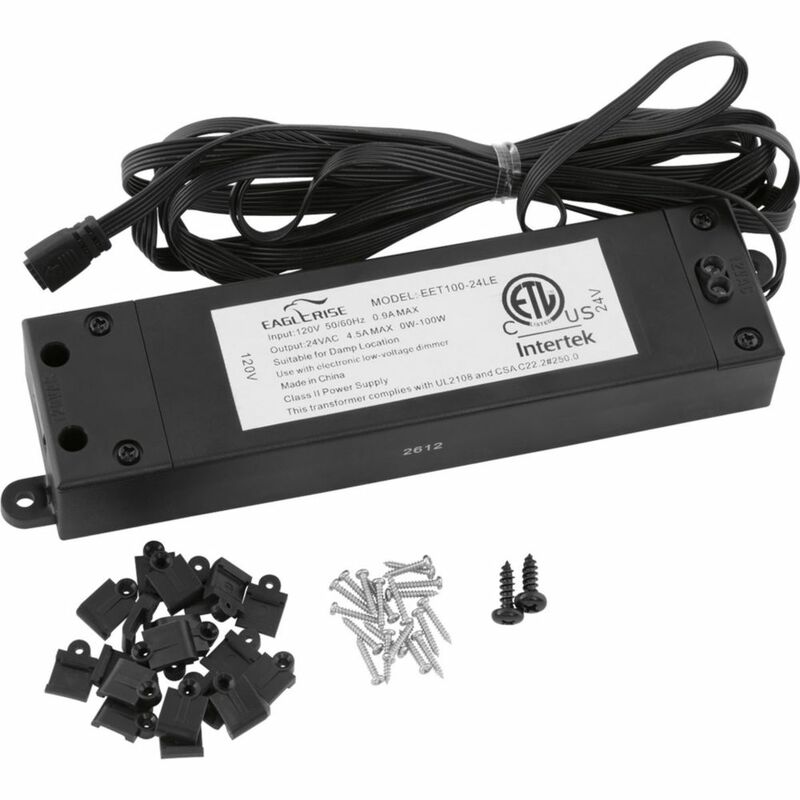 Use the 200 Watt transformer to program your Low Voltage landscape lights in a number of ways , Dusk to Dawn,Dusk Timer, Astro Timer, Photo On, Time Off.The transformer is programming is quick and easy by the push of a button. Other features of the transformer include Test function; Load indicator 3x12V Channels+ 1x 120V Channel. The Black plastic housing is waterproof and is safe for outdoor installation. The transformer can be mounted to the side of a house, deck or post. The Hampton Bay 600-Watt Transformer with Light-Sensor and Digital timer allow you to control your landscape lighting system automatically. Use the 200 Watt transformer to program your Low Voltage landscape lights in a number of ways , Dusk to Dawn,Dusk Timer, Astro Timer, Photo On, Time Off.The transformer is programming is quick and easy by the push of a button. Other features of the transformer include Test function; Load indicator 3x12V Channels+ 1x 120V Channel. The Black plastic housing is waterproof and is safe for outdoor installation. The transformer can be mounted to the side of a house, deck or post. 300-watt stainless steel transformer with three ft. 12-gauge cord with grounding plug and thermal protection in the primary circuit to avoid overheating. Multiple secondary taps allows maximum light output and lamp life for long or short runs and loading. 300-watt transformer with three ft. 12-gauge cord with grounding plug and thermal protection in the primary circuit to avoid overheating. Multiple secondary taps allows maximum light output and lamp life for long or short runs and loading. Hide-A-Lite 4 Led Tape Light 24-Volt 100-Watt Transformer Hide-a-Lite 4 LED tape lighting is state-of-the-art technology for the 21st century. Begin the creation of your customized installation with this transformer which can provide power for up to 33 feet of Progress Lighting LED tape. Includes integrated short circuit and overload protection with auto shutdown/reset. Dimmable with many incandescent and most ELV controls.